We have gone out of our way to find a great and sustainable source for our yellow fin tuna. We buy our tuna from the Philippines and it is ocean wise due to the fact that it is caught by small boats with hook and line. This method of fishing is easy on the environment and promotes minimal bi catch. Yellow fin, often referred to as Ahi, is a dense meaty fish and has many characteristics of steak. It is great for grilling and searing. Avoid Bluefin Tuna which is completely over fished. Yellowfin is often marketed as ahi, from the Hawaiian ʻahi, a name also used there for the closely related bigeye tuna. The species name, albacares ("white meat") can also lead to confusion: in English, the albacore tuna (Thunnus alalunga) is a different species, while yellowfin is officially designated albacore in French and referred to as albacora by Portuguese fishermen. Formerly, much of the commercial catch was made by pole-and-line fishing, using live bait such as anchovy to attract schools of tuna close to the fishing vessel that were then taken with baited jigs on sturdy bamboo or fiberglass poles or on handlines. This fishery, which targeted skipjack and occasionally albacore, as well as yellowfin, for canning, reached its heyday between World War I and the 1950s before declining. The most well-known fleet of pole-and-line boats sailed from San Diego in California and exploited abundant stocks in Mexican waters, as well as further south to Panama, Costa Rica, and the Galapagos Islands. Purse-seine vessels locate tuna using onboard lookouts, as was done in the pole-and-line fishery, but they also employ sophisticated onboard electronics, sea-surface temperature and other satellite data, and helicopters overhead. Once a school is located, the net is set around it. A single set may yield 100 t (98 long tons; 110 short tons). Modern tuna seiners have a capacity up to 2,000 metric tons (2,000 long tons; 2,200 short tons), reach speeds of over 17 knots (31 km/h; 20 mph), and carry multiple spotting helicopters. Purse seining for yellowfin tuna became highly controversial in the late 1970s when it became apparent that the eastern Pacific fishery was killing many spinner dolphins, pantropical spotted dolphins, and other cetaceans (often called "porpoises" by the tuna fleet) that accompany the fish. This association has been long-recognized by commercial tuna fishermen. Since the introduction of "dolphin-friendly" labeling, an increasing number of purse seine sets are now made on "free schools" unassociated with dolphins, as well as schools that associate with floating objects—another long-understood association that has grown in importance in tuna fisheries. The latter practice in particular has a major ecological impact because of the high proportion of bycatch, including manta rays, sea turtles, pelagic sharks, billfish, and other threatened marine species taken by setting nets around logs and other floating objects. Such tuna are often significantly smaller than the larger adult tuna associated with dolphins. The removal of huge numbers of juvenile yellowfin and bigeye tuna that have yet to reach breeding age has major potential consequences for tuna stocks worldwide. Different seafood sustainability guides come to different conclusions about whether yellowfin fishing is sustainable. The Audubon's Seafood Guide (a guide for what types of marine food products are not ecofriendly) lists troll-caught tuna as "OK", but labels long-line caught as "Be Careful". 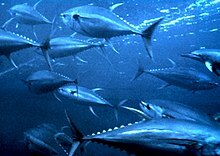 In 2010, Greenpeace International added the yellowfin tuna to its seafood red list. The Greenpeace International seafood red list is a "list of fish that are commonly sold in supermarkets around the world, and which have a very high risk of being sourced from unsustainable fisheries".